That season is upon us and it’s time to wonder once again whatever happened to the spirit of Christmas. Of late, political/religious correctness has added its voice to the consumer Babel and is deadening the religious message still further, so let’s refresh our take on this most popular and stressful holiday of the year. 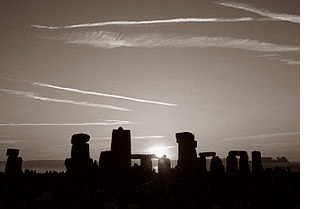 In pagan days, this time was called Yule, and celebrated the winter solstice (sun standing still, or the turning point in its journey away from Earth). The early Christians didn’t simply replace the old holiday with the new – they adapted the notion of turning point to carry their own message. The birthday of baby Jesus became a pivot between the fasting period of Advent (the coming) and the 12 days of Christmas, when friends and family made gifts for one other. They conclude with the Epiphany, when the new is fully manifest and we return to daily life with renewed spirit. Clearly, this is meant to be a time of reflection. In fact, Advent was set aside for prayer, fasting and penitence. We don’t see much of that these days. We’re busier than ever – not just with cards and gifts, but also with food and household shopping. Business too must be wound up for the break. There are office parties to attend, damaged relationships to repair and prodigious quantities of food and drink to consume. We’re expected to shop until Christmas Eve, take a 24-hour break, and then go right back to shop in an even greater Boxing Day frenzy. These are only some of the pressures. Guilt is another, for it’s squirmfully obvious that even though few of us consider ourselves rich, we’re more wealthy and wasteful than most human beings will ever imagine – not that it makes us happier. For many, Christmas time magnifies loneliness and isolation beyond all reason. This is the busiest time of year for mental health workers. Theoretically, our involvement is a matter of choice. On the other hand our society, which specializes in delivering high-speed, if not instant, gratification, also specializes in telling us what we want – why bother with the miseries of fasting when we can get straight to the good stuff? How do we go against the flow? Should we seal ourselves off from the mêlée and contemplate our sins until the 25th? Slowing down to take a deep breath right now sounds like an act of radical, almost impossible sanity – but as we’ll be reminded once again in the New Year, making resolutions is one thing, keeping them is another. Anyone who meditates or tries in any way to live a contemplative life is faced with this stubborn problem. To succeed, our resolution must be understood as a turning point and not an end in itself. Change is a process in which the same decision is made again and again – not just when we feel like it but every time the old habit reasserts itself. Whether you want to quit smoking, practice mindfulness or resist the holiday madness, you have to know and accept your present circumstances, set a realistic goal and understand that getting from here to there is a journey of many steps. It would be great if we could set aside this time of year for quiet and mindful reflection, peace and good will, but all we ever do is lament the fact that no one does it. The beauty of the meditative life – and also its great difficulty – is that it’s all a matter of attitude. We don’t have to follow the crowd, but neither do we have to stick out like a sore thumb. To cultivate a healthy Christmas spirit, reflect that we’re counting down to the shortest day, and that even though the coldest months are yet to come, the light is on the upswing. You might take a moment to breathe, only to find yourself on your feet again, driven by the tide of That Which Must Be Done. Don’t be disheartened. Especially, don’t resort to blaming anyone – whether it’s yourself, modern times or global consumerism. Just keep making your resolution, no matter how many battles you lose. Grab each moment of sanity in the knowledge that you’ll lose it again. Keep up this spirit and sooner or later the tide will turn. With determination and patience, mindful reflection does outgrow compulsion. And while you’re doing all that, there’s absolutely no reason why you can’t enjoy a Merry Christmas and a Happy New Year. A version of this post originally appeared in a 2006 issue of The Montreal Gazette. EXACTLY the best medicine. What would be even better is to step off the roller coaster and find a corner on this planet that actually does not celebrate Christmas avoiding this temporary and fake 24 hour expensive and fleeting moment of compassion…(bitter, resentful, unpleasant? I think more like frustrated, disenchanted, disillusioned). Yet I do thank you for this virtuous reminder and a remarkable and heart/mind warming blog. What we want is one thing, what we need is another. What we DO with what we GET, that is really important. We already have hope, faith and courage. The deeper we dig the more we have. So isn’t every day like Christmas? Sometimes we just have crossed signals. — a Warrior, my choice of weapon, a white Fender Stratocaster. Let the music play,that’s where the medicine is. It’s all good, it’s all “BLUES” man. Love to you all, a Warrior.